My ears are aching from the wild ocean wind. The cobalt sea is peaking in ragged white out beyond the break water. We are in Warrnambool, a country town in the south of Victoria, in Australia. Warrnambool is not far from the twelve apostles, the stony giant monoliths cut off from the mainland by the fierce erosion of wind and sea. 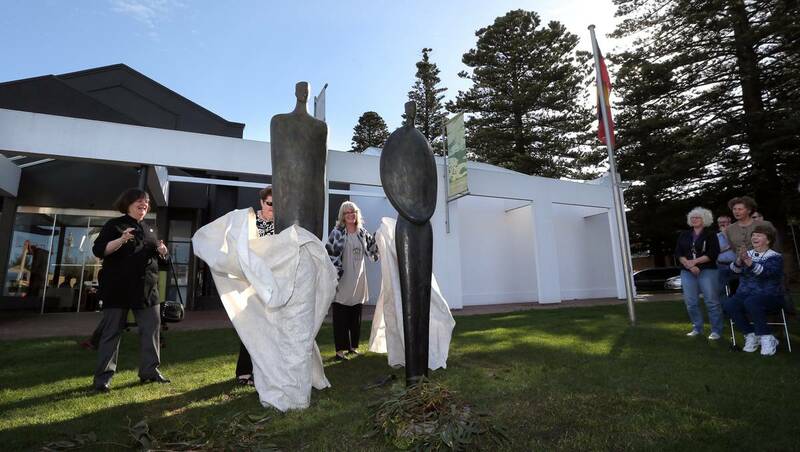 We are here to install my ‘Guardians’, male and female, 2.4 metres high, for the Warrnambool Art Museum, outside the entrance to the gallery on the Civic Green. 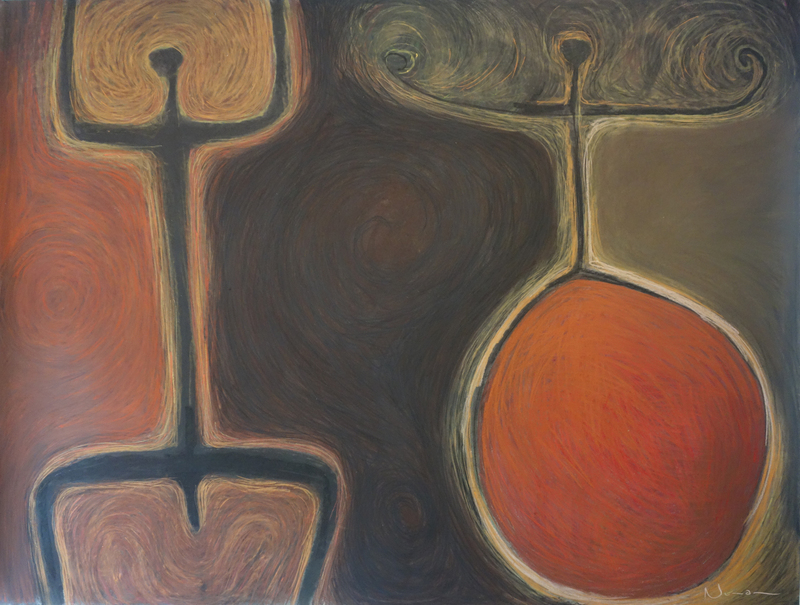 The Guardians have been part of my emerging language as an artist since the time my childish world was happily turned upside down at the age of 10. I was brought up in a slightly unusual family as my father, Brian Nunan, is an artist and was totally supported in all his dreaming by my mother. One year, he packed all six of us up in an old landrover and trailor and took us up into the desert where we finally settled in a derelict world war 2, concrete army block house across the bay from Darwin, near an aboriginal settlement. This period of time brought us in contact with the art of the local people, their corroborees, their connection to the earth and their own earthy characters. 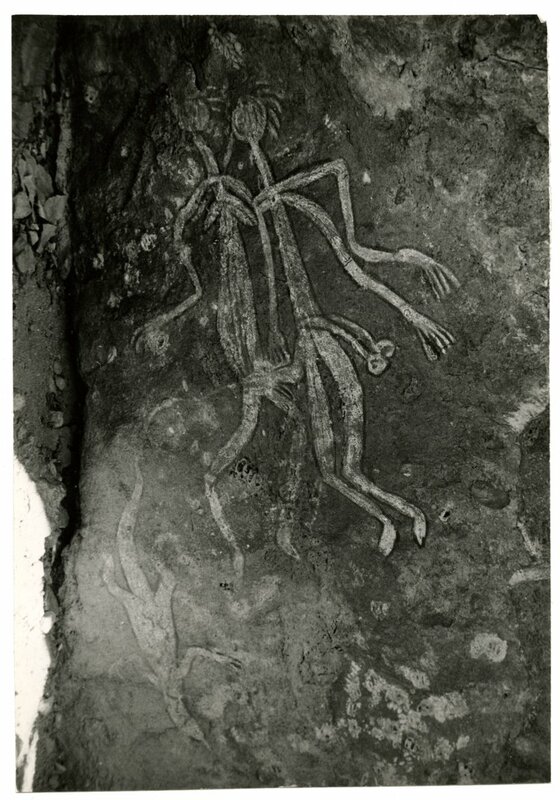 Their art seemed spiritual, with the figures of animals and people drawn in the caves and on bark feeling almost ethereal, as though the real message is their essence. I was aware even then of how extraordinary it was to be here in Australia amongst a people from an original culture, over 60,000 years old. Not much had changed till we got here 200 years ago. So it was still possible to touch that ancient history through the people themselves. From my perspective as a young girl, this was at odds with the strong physicality and ‘realism’ of the normal life I had come from down south and far from the figurative works of Rodin and Michaelangelo, artists who would become important to me as a growing teenager. Some years later, when I was 20, I did a trip with my father into the outback to draw and paint and with a mission to find some caves near Arnhem land that he had been to in another year. We didn’t find the caves he was searching for, but we did come across another cave with a gigantic boulder at its entrance. 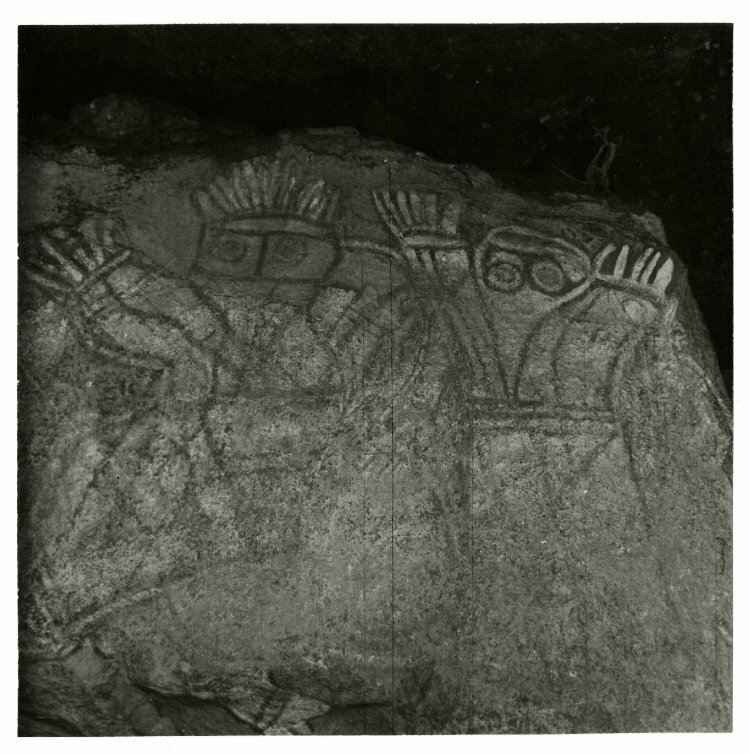 Painted on the boulder were two big figures with their arms and hands outstretched warningly, their eyes huge and dark. To me they felt like ‘Guardians’. It felt as though we were entering a sacred area and these figures were warding away bad spirits. So, with a feeling of great awe and careful respect we went into the cave and saw the artist’s space, an elevated rock, its surface well worn from the centuries, perhaps millenia, of artists lying in this space, the divits where he crushed his stone and the bits of twigs for painting. All around the cave on the rock walls were beautiful xray drawings of animals and human figures hunting or collecting or just being. The space felt very peaceful and we left with a feeling of having experienced a profound spiritual connection. I can’t tell you of the impression this made for me in my life. I return to it again and again in my work, and I feel the presence of these Guardians always. 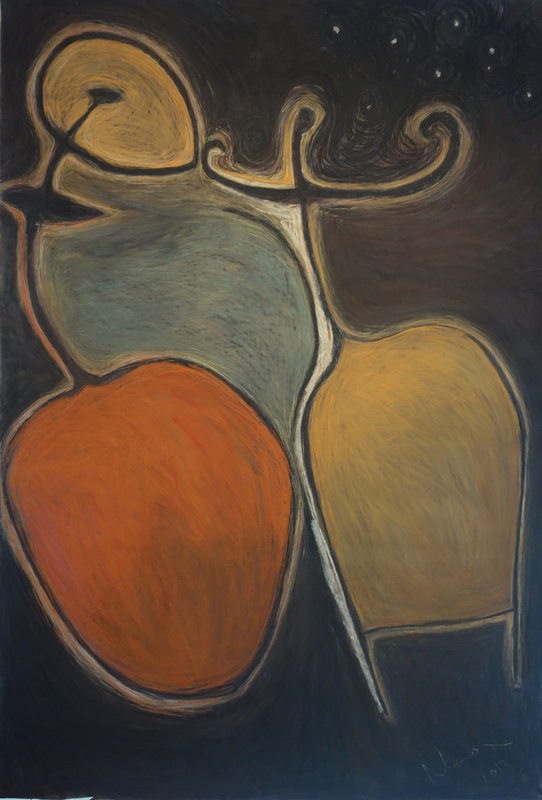 The Guardians emerged in my work at first as ‘Night’ and ‘Day‘ and then they became little fecund women figures on hilltops and single figures in the landscape, ethereal figures connecting to the spirit of the land. In other ancient cultures I have found Guardians too. The Etruscans, the Cycladic Greeks, the Egyptians, the Africans, the pre-Columbians… The Guardians are amongst the great archetypes of civilization and deep down, even today, and without hocus pocus, we know we have to protect the things that are sacred to us, our inner selves, our children, our homes. The Guardians at an entrance are saying, come in, but be respectful. For me, these Guardians symbolically represent the balance of life, they are yin and yang, male and female, conscious and unconscious, night and day. 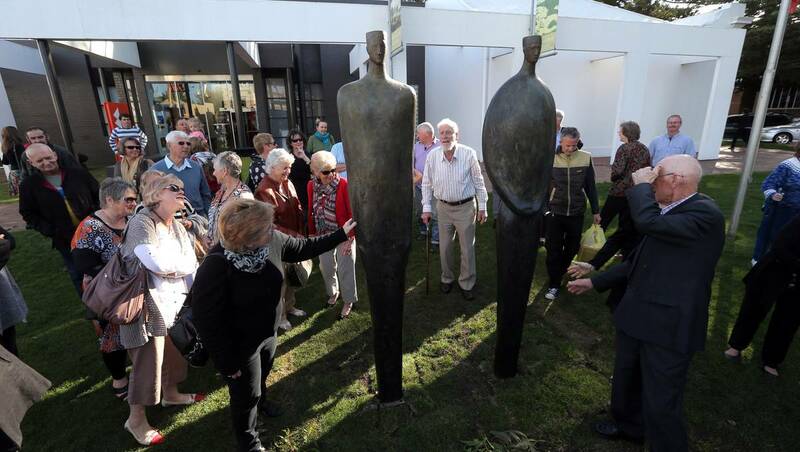 The unveiling of my sculptures in Warrnambool took place on a mild Saturday, 10th November, 2012. I had the blessing of aboriginal elder, Mr Robert Lowe, or Uncle Robbie, who performed a smoking ceremony to cleanse the land and the sculptures before their acceptance. 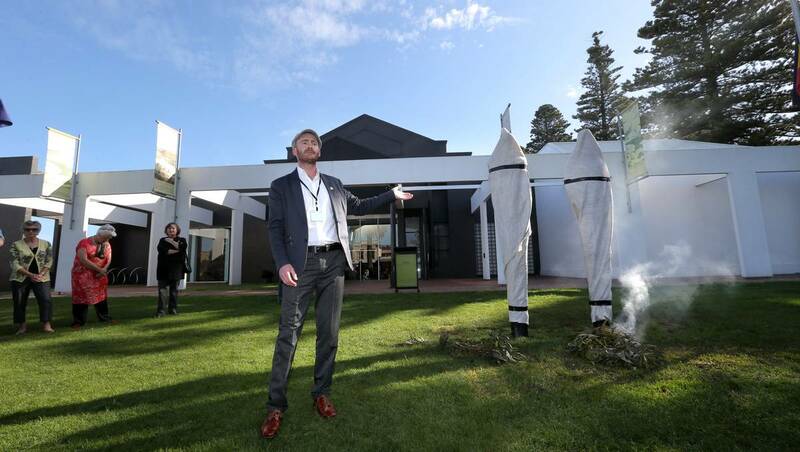 He placed burning gum leaves in front of the sculptures and their smoke billowed around us as we gave our speeches and the sculptures were finally unveiled. It felt significant to me to have an aboriginal elder here at the gallery whose cultural heritage has influenced my own and in particular these Guardians. 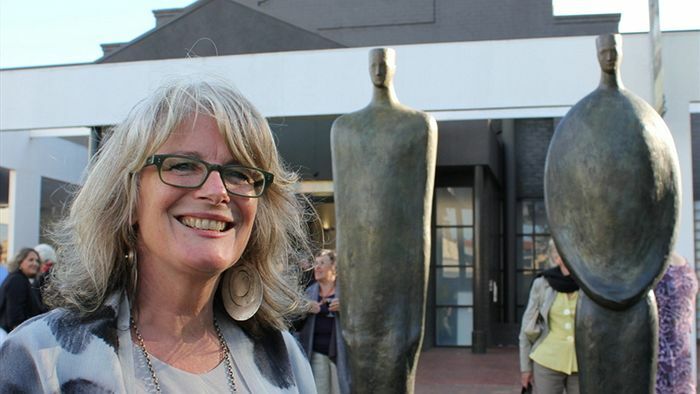 I am the luckiest person alive to have a patron like Professor Barbara van Ernst, who has been collecting my work for the past 20 years and has recently also bought my work for Hamilton Regional Gallery. 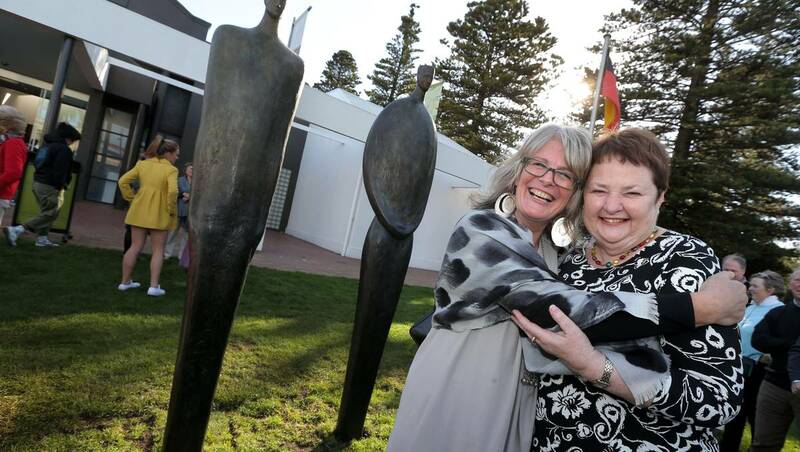 Along with John Cunningham, Director of the Warrnambool Gallery, she commissioned me to create the Guardians for Warrnambool Civic Green. John Cunningham has such a visionary cultural belief in Warrnambool and somehow my art fitted into part of the manifestation. 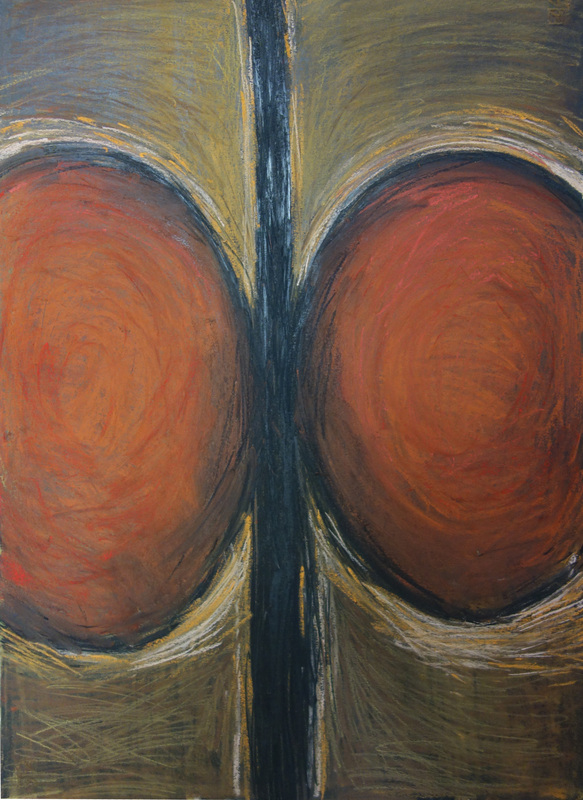 It is truly a great synergy when artist, patron and gallery can work together to help make culture grow. 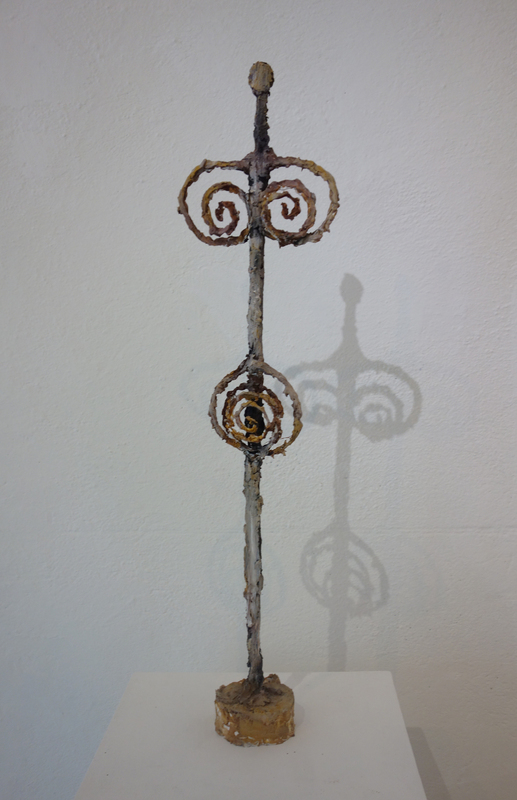 While we were Artists in Residence in Hong Kong at the Yew Chung International School, Shona created the bronze sculpture, ‘Harvest’, in an edition of eight. 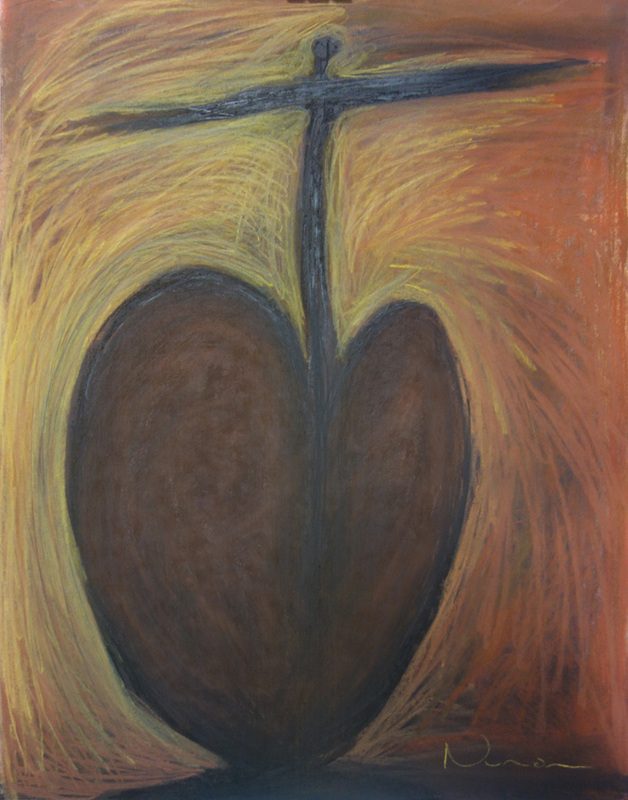 The sale of all eight works will go to the charity to help build schools for underprivileged children in China. If you would like to know more about this, please click here to download a pdf. info package for Seeds of Hope and the Harvest sculpture.